Remedia is an Association and a Research Group which operates within the Department of Humanities at the University of Turin. It was established in 2014. 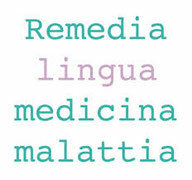 The main purpose of Remedia is to investigate the links between language, medicine and disease. The core members of the groups are linguists, along with doctors, philosophers and historians. Our research areas are History of Medical language, Medical Linguistics and Clinical Linguistics.